A previously filled tooth where more filling exists than tooth. The existing tooth structure becomes weakened and can no longer support the filling. Crowns strengthen and protect the remaining tooth structure and can improve the appearance of your teeth. Crowns can be made from different materials which include the full porcelain crown, the porcelain fused-to-metal crown and the all-metal crown. Here at Curtin Dental Care, we recommend porcelain crowns for our patients due to the durability and strength and their aesthetically pleasing appearance in the mouth. It is common that the fitting of a crown is completed in two visits. 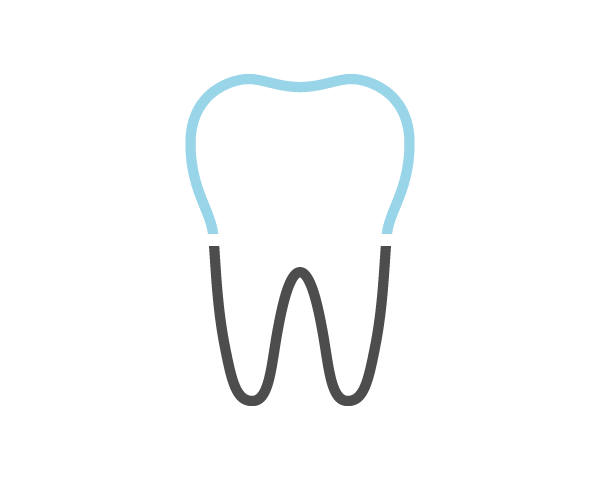 During your first visit, the tooth is prepared for the crown, an impression is made of the tooth, and a temporary crown is placed over the prepared tooth. At the next visit, the temporary crown is removed and the final crown is fitted, adjusted and finally cemented into place. A bridge is a treatment option used to replace one or several teeth. The teeth on each end of the space are used as anchors to support the replacement tooth. It is essential to insert a replacement tooth as soon as possible when a tooth is lost as teeth may move into the space changing your bite over time. This changed bite may result in sore jaws, gum disease, or decay (due to more difficult hygiene). Bridges are a more permanent solution, removable only by us at the practice. As with other types of crowns, a bridge can be made of metal, porcelain or a combination of these two. Again at Curtin Dental Care, we recommend porcelain for use on our patients. To prepare a bridge, diagnostic models are taken to study the optimum way to perform this procedure. After studies are completed, the teeth used to attach the bridge are carefully reshaped. Impressions are taken and from these impressions, the bridge is made by a dental technician. The laboratory time is usually 2 to 3 weeks – during this time a temporary acrylic bridge is cemented to place. Brush and floss daily all areas around the bridge. It is not possible to floss between the replacement tooth and the attaching crowns as it is made as a solid piece. In order to solve this problem, it is necessary to use a special type of floss to go under the replacement tooth and keep this area of gum tissue healthy.